2018 was a year mostly characterized by crashing cryptocurrency prices. With 2019 underway, the community and analysts are split when it comes to price prospects and also when it comes to matters related to the protocol layer. We delve into three of the biggest conflicts that have split the Bitcoin community so far in 2019. Block size has been a debate as far back as 2010. Discussions about increasing the block size intensified in 2015 and a two-year conflict took place which resulted in two failed upgrades, the New York Agreement and the Hong Kong agreement, and ultimately in Bitcoin Cash hard forking from the Bitcoin network in August of 2017. The block size debate has been reinvigorated recently this year but this time it is a proposition to lower the block size. Bitcoin Core developer Luke Dash Jr. has put forward the idea of lowering the block size via a soft fork. However, this has proven to be a contentious idea among the Bitcoin community. The argument for decreasing the block size is increased decentralization and security in the Bitcoin network. Smaller blocks would make it feasible for more users to run full nodes, thereby increasing the number of computers ensuring miners are processing valid transactions. On the other hand, decreasing block size would pose a threat to scalability. Times of high demand for on-chain transactions where users end up paying high fees, such as in late 2017 as illustrated below, would be exacerbated if the network upgraded to have smaller blocks. Fungibility deals with the idea of whether every Bitcoin is equal to every other Bitcoin. At the moment, every Bitcoin is accepted equally. But in the future, bitcoins which were involved in illegal or illicit activities may be worth less or even, more importantly, entirely prohibited by some merchants. A lack of fungibility could pose a severe risk to the adoption of Bitcoin as digital money. For example, recent developments in anti-money laundering (AML) policies in some countries, such as Russia, affect cryptocurrencies that have been previously used for criminal purposes. Any cryptocurrency that was acquired through criminal means and subsequently transferred to fiat currency will now be considered laundered. It might be just a question of time when major financial institutions will follow suit and refute such dirty cryptocurrency, significantly limiting their chances of being used. 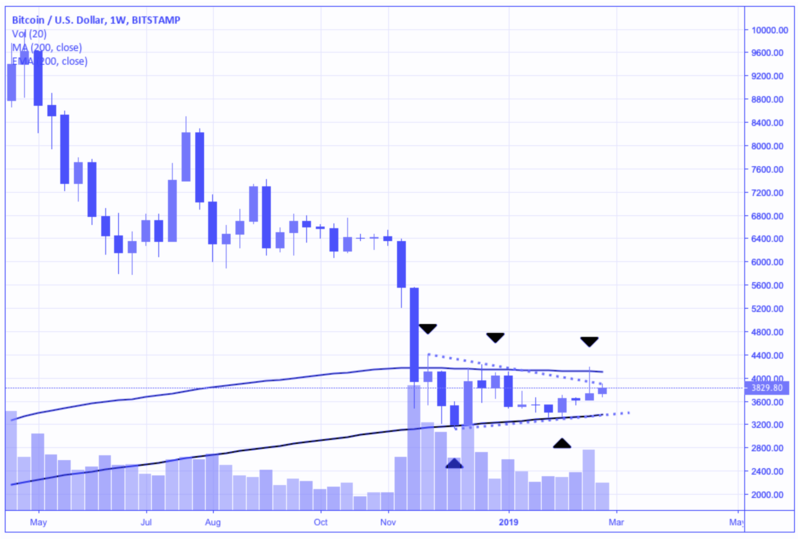 As we continue with 2019, analysts are split as to whether the price bottom is in or whether we are going to see the price break even further below the 2018 lows. There are arguments to be made both for those with bullish price prospects and those with bearish price prospects. Fundamentally, the network is likely more secure than it has been previously. The hash rate securing the Bitcoin network has also tripled since the start of January 2018, increasing from around 15 EH/s to over 45 EH/s as illustrated below. This is a sign of a greater number of miners securing the network as well as more efficient hardware being applied. Technically, analysts are also split. Price has been forming lower highs (indicated by the black arrows below) which is a sign of bearish conditions, but price also has been forming higher lows (also indicated by the black arrows) which is a sign of more bullish conditions. Furthermore, the price has been meeting resistance at the weekly 200 exponential moving average (in purple below) while meeting support at the weekly 200 simple moving average (in black below). We are likely to find out about price prospects shortly, as price cannot stay consolidating forever, especially in an asset as volatile as Bitcoin. Fungibility and block size, however, are issues which are more ingrained in the fabric of Bitcoin and are not going anywhere soon. It’s not all bad, however, as conflicts such as these serve a purpose. They force the community to consider what the best future is for Bitcoin and what changes we can push into the protocol to make it a reality.